There's a legend about St. Nicholas that many fanatics of Early Christians desperately want to be true. The story goes that Nicholas and Arius were among many at the Council of Nicaea in the midst of a heated theological debate about the nature of God. That's when Nicholas grabbed a brick, lifted it up, and declared that as the brick was one substance in three parts, i.e. earth, fire, and water, so also was God one substance (homoousios) made up of three parts. Father. Son. Holy Spirit. The brick then burst into flames, vanished from their site, and left only water to drip from Nicholas' hands and onto the floor. Arius, on the other hand, was a gifted orator* and began to spit rhymes about how Jesus was not fully divine. Christ was actually not of the same substance as God the Father but had a created beginning. I like to think that after his rhythmic rhetoric, Arius dropped his mic, shook the dust from his shoulders, winked at his counterparts, and stepped aside in challenge. St. Nicholas wanted nothing to do with this blasphemous, albeit popular and catchy, theological beat. So the Bishop of Myra stood up, took off his crusty sandal, and slapped the would-be heretic across the face. 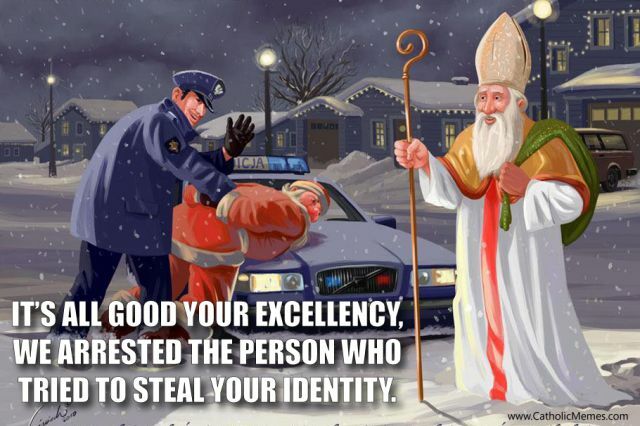 That's right, St. Nick sandal slapped his theological opponent. So much for being jolly. It's not known whether St. Nicholas was even at the Council of Nicaea and unlikely that his nemesis Arius was even invited, as he was not a bishop and would have had to send representation. Still, the story gives hints and guesses to the pure passion of the man who would be morphed into a Coca-Cola ad campaign of the 1930's and the foundation for consumer-driven Christmas, long lists that keep places like Macy's, Walmart, and Amazon.com in business, and the parental threat that runs a muck this time of year- better be good, Santa's watching. Needless to say, anytime I pass by a makeshift North Pole in a shopping mall I pause and think, would St. Nicholas sandal slap the bearded icon and all nine of his reindeer? I wonder if Nicholas would do the same to Santa Claus as he supposedly did to Arius, counting Claus as some sort of blasphemous and offensive distortion of who he was and all he aspired to be as a disciple of Jesus and leader in Christ's church. Sure, there is much to like about Santa. Maybe the old fella encourages the imaginations of children and playful generosity of parents. It's possible that Santa is a fun folklore to hand down to each generation, fostering a spirit of mystery and anticipation common to the season. It's also possible that Santa has overshadowed the more brilliant stories that were told for generations before soda companies and capitalism got hold of him. Stories like the time when St. Nicholas rescued three women about to be sold by their father into an ancient human trafficking ring. The family had run out of money and found themselves uncertain about how to live another day. The only option the father felt he had was to sell off his young girls into prostitution. Bishop Nicholas got word and on two separate occasions anonymously tossed bags of money into an open window. The money, which came from Nicholas' inheritance, was enough to pay the dowry needed to be wed and prevent them from captivity and the horrors of prostitution. But there was still one more daughter. And the father was determined to find out the identity of this mysterious donor. As the father camped out on the roof of his home he saw Nicholas dropping a bag of money down their chimney and into a sock hung out to dry. Anyway, caught red-handed, Nicholas made the man promise to protect his identity and refrain from revealing who had provided such elaborate funds. Thus the beginning of the mystery behind the man with a beard and red mitre. Yet the story was too good not to be told. The prophetic and radical generosity of those who benefited from and followed behind the secret graces of Nicholas even birthed new legends. There's the story of those wrongly accused of a crime and sentenced to death by beheading. Just as the sword was about to come down, Nicholas intervened, seized the downward thrusting sword in his calloused hand, halted their execution, and played a pivotal role in accusations being expunged. There's the tale of two parents whose enslaved child was lifted by his hair out of the courts of an oppressive ruler and returned to his mother and father by the spirit of the deceased Saint Nicholas. It can be said that Nicholas was one of the earliest advocates of victims of child labor and slavery, human trafficking, and those wrongly accused who sit on death row. A far cry from what has become to be known as Santa Claus. As we approach December 6th and the Feast of St. Nicholas, may we pay homage to the faithful witness and man behind the myth. May we tell our children these sacred stories of justice, advocacy, intervention, concern for the poor, and desire to give mysteriously more than receive abundantly. Maybe then we will begin to tap into the true Spirit of Christmas, which neither involves sandal slapping our theological opponents nor trampling those in front of us in the lines at your local retail store. Happy Feast of St. Nicholas. *"Arius' views were all the more popular because he combined an eloquent preaching style with a flair for public relations. In the opening stages of the conflict, he put ideas into jingles, which set to simple tunes like a radio commercial, were being sung by the dock-workers, the street-hawkers, and the school children of the city" (Bruce Shelley, Church History in Plain Language 100-101).